John's father died in the June quarter 1888, although by then John had two more younger siblings, Mary and Hugh (see Footnote below). In 1891 the family were living at 1 Rock Villa, Fairfield. (Census RG 12/2779) Ten years later (1901 Census RG 13/3269) the family were still all together, at the same address (now called 'Ivyleigh') and John was employed as a "Carman". On 23 April 1903 John married Catherine Wearne, in St. Peter's Church, Newlyn, Cornwall. The following year they returned to Buxton and in 1911 (Census RG 14/21243) were living at 2 St James Street, with their two children, William and Elsie. John was employed as a "Carter" for a "Wine Merchant". According to the SDGW database John enlisted in Buxton. His Medal Index Card (MIC) gives no indication when he entered the War, usually indicating it was after 31st December 1915, as he did not qualify for the 1914-15 Star. However, from his Service Number it seems John enlisted around Feb/March 1916. There is, however, some discord concerning which Battalions he served with and in which order. Unfortunately, John's Service Papers, like so many others, were lost in September 1940, when a German bombing raid struck the War Office repository, so is difficult to resolve. (a) John's MIC has him enlisting as Private 63609, Durham Light Infantry, before transferring to the Labour Corps - Private 21377. (c) The SDGW database is similar, but his Sherwood Foresters' number is given as '57043'. John's 5847 number is consistent with a Derby Scheme man. A number of men of the 'Derby Scheme' were posted to the 3/6th Battalion, The Sherwood Foresters, and were then moved on to different regiments and were renumbered. That would suggest he went initially from the Sherwood Foresters to the Durham Light Infantry before being finally posted to the Labour Corps, and that he went overseas first with Durham Light Infantry. His final transfer to the Labour Corps was either because he was wounded or he had some specialist skill that they needed, although from his peace time occupations the latter seems unlikely. 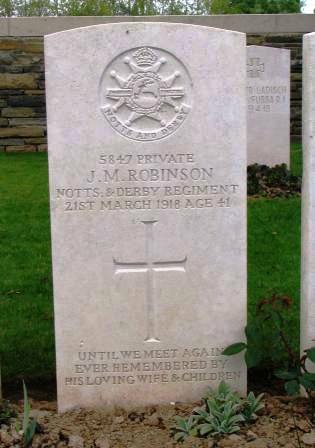 The constant in all three variations is that John was serving in the Labour Corps when he was killed in action. The Long, Long Trail says that the Labour Corps was formed in January 1917, " ...the Corps grew to some 389,900 men (more than 10% of the total size of the Army). The Corps was manned by Officers and other ranks who had been medically rated below the "A1" condition needed for front line service. Labour Corps units were often deployed for work within range of the enemy guns, sometimes for lengthy periods. In April 1917, a number of infantry battalions were transferred to the Corps. In the crises of March and April 1918 on the Western Front, Labour Corps units were used as emergency infantry. The Corps always suffered from its treatment as something of a second class organisation: for example, the men who died are commemorated under their original regiment, with Labour Corps being secondary." "In the Battle Zone, where the fog had completely lifted, an attack on the defences covering Noreuil, held by the 2/5th Sherwood Foresters and an R.E. [Royal Engineers] detachment, began as early as 10.40 am, being preceded by a heavy barrage. Met by fire from the defences and the covering batteries, the enemy ceased his frontal attack to wait for the effects of the advance around both flanks of the position, that in the Hirondelle valley being already perceptible. To meet these turning movements, the right flank of the defence was thrown back, whilst, on the left, a line was manned along the road from Noreuil towards Longatte. The movement up the Hirondelle valley gained ground so rapidly, however, that the right flank of this position was soon driven in, Noreuil was captured, and the men still holding trenches in front of it were cut off." Action on the 16th February 1918 and is buried in Rocquigny-Equancourt Road British Cemetery, Manancourt. Foresters, both Buxton men, were killed in the same action on 21 March 1918. 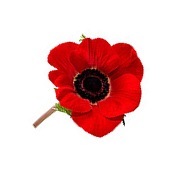 · I am grateful to Mike Briggs for helping sort out the order of John's service with his three Battalions.